The power of national and transnational constitutional courts to have the final say in interpreting the constitution or an international treaty has been endlessly discussed. What does it mean for democratic governance that non-elected judges influence politics and policies? The authors of Judicial Power - legal scholars, political scientists, and judges - take a fresh look at this problem. To date, research has concentrated on the legitimacy, or the effectiveness, or specific decision-making methods of constitutional courts. By contrast, the authors here explore the relationship among these three factors. 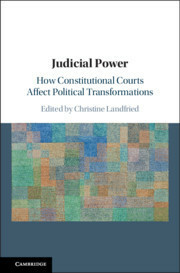 This book presents the hypothesis that judicial review allows for a method of reflecting on social integration that differs from political methods, and, precisely because of the difference between judicial and political decision-making, strengthens democratic governance. This hypothesis is tested in case studies on the role of constitutional courts in political transformations, on the methods of these courts, and on transnational judicial interactions. Introduction Christine Landfried; Part I. Democratic Legitimacy of Judicial Power: 1. Judicial power and democracy Martin M. Shapiro; 2. Judicial politics versus ordinary politics: is the constitutional court judge caught in the middle? Michel Rosenfeld; 3. Judicialization of politics or politicization of the courts in new democracies? Mary L. Volcansek; 4. European judicial appointments reform: a neo-institutional approach Mitchel Lasser; 5. The law of democracy and the European Court of human rights Richard H. Pildes; Part II. Democratic Effectiveness of Judicial Power: 6. Constitutional court and politics: the Polish crisis Lech Garlicki; 7. Democracy, political crisis, and constitutional jurisdiction: the leading role of the Brazilian Supreme Court Luís Roberto Barroso and Aline Osório; 8. Judicial power and European integration: the case of Germany Franz C. Mayer; 9. Fundamental rights in Europe after opinion 2/13: the hidden promise of mutual trust Timothy Roes and Bilyana Petkova; Part III. Legitimacy, Effectiveness, and Judicial Methods of Decision-Making: 10. Transnational judicial interactions and the diplomatization of judicial decision-making Gertrude Lübbe-Wolff; 11. Judging methods of mediating conflicts: recognizing and accommodating differences in pluralist legal regimes Judith Resnik; 12. On the representativeness of constitutional courts: how to strengthen the legitimacy of rights adjudicating courts without undermining their independence Mattias Kumm; 13. After the heroes have left the scene: temporality in the study of constitutional court judges Mark Tushnet; Part IV. Judicial Power in Processes of Transformation: 14. What exactly is political about Constitutional Adjudication? Dieter Grimm; 15. Populism, constitutional courts, and civil society Andrew Arato; 16. Judicial power in processes of transformation Ulrich K. Preuß; 17. Neither legal nor illegal: today's operational spaces barely captured in law Saskia Sassen. Christine Landfried is Professor Emerita of Political Science at Hamburg University, and Senior Fellow at the Hertie School of Governance, Berlin. She was the Max Weber Professor in German and European Studies at New York University (NYU) from 2014 to 2016, and Senior Emile Noël Fellow at NYU School of Law. She received the Schader Award 2016 for innovative research. She investigates the role of constitutional courts, the impact of campaign finance on democratic governance, and European integration. In her research on the European Union she explores the conditions that enhance the positive potential of cultural, economic, and political difference for democratic governance. Her articles include 'The Selection Process of Constitutional Court Judges in Germany' (2006), 'The Concept of Difference' (2011), and 'Never-Ending Crisis? Germany and the Future of Europe' (2013).